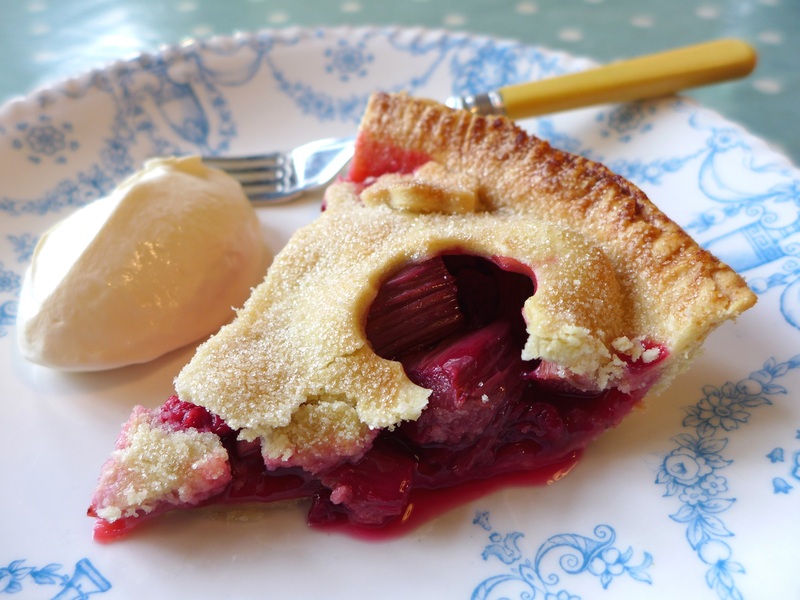 I love the combination of rhubarb and raspberries … it’s one of my favourite fruit crumbles … and the first of the rhubarb is already shooting up in the kitchen garden. I used raspberries from the freezer but if you can get good fresh ones, by all means use them. If you do use frozen, defrost them in a sieve over a bowl to get rid of some of the juice, otherwise they’ll make the pie base too soggy. For the same reason, this pie is best eaten within a few hours of it coming out of the oven. If that’s an issue for you, just make a pie with a lid but no base. Pre-heat the oven to 200C/400F/Gas Mark 6. Put a baking sheet in the oven to heat up, placing it above the centre. Grease a shallow 22cm pie tin. Make the pastry by rubbing the fats into the flour and salt until you get a breadcrumb consistency. Add the water and cut it in until the pastry comes together in a ball. Knead briefly to remove any cracks, wrap in cling film and refrigerate for half an hour. 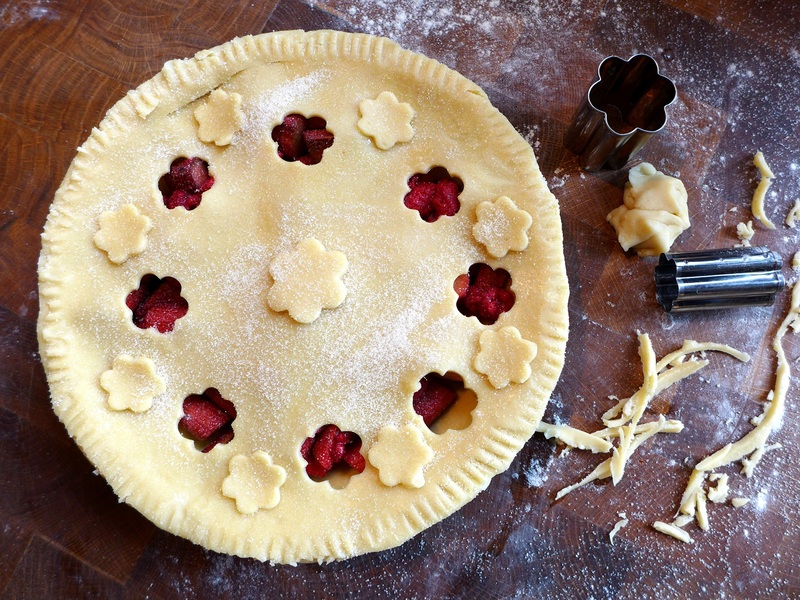 Put the rhubarb chunks in a bowl, mix with the sugar and cornflour and leave to sit for 15 minutes: the cornflour helps stop the fruit juices flooding the pastry. Gently stir in the raspberries. Dust a board with flour and roll out two-thirds of the pastry to line the pie dish. Put it back in the fridge while you roll out the remaining pastry to make the lid. 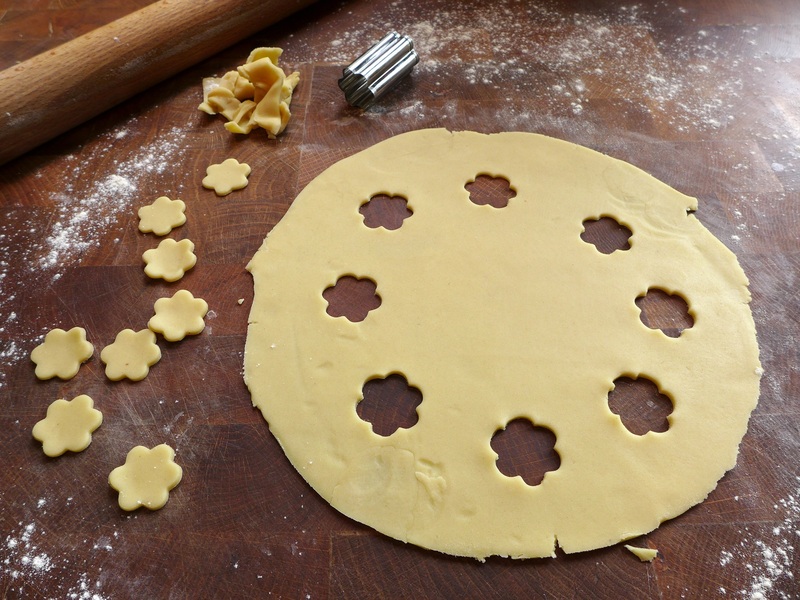 Cut out small shapes with a flower or star cutter (for instance) to make a pattern around the lid, as in the picture above. Place the filling in the lined pie tin and egg wash the edge of the pastry. Egg wash the lid before you put it on top otherwise you could smear fruit juices all over it. Put on the lid, trim the edges and crimp to seal. Egg wash the pastry cut-outs and place them on the pie. Scatter with caster sugar. Place on the pre-heated baking sheet and cook for 15 minutes, then reduce the heat to 190C/375F/Gas Mark 5 and cook for another 15-20 minutes, until the pastry is crisp and golden. Allow to cool slightly before cutting and serving, with ice cream or crème fraîche. 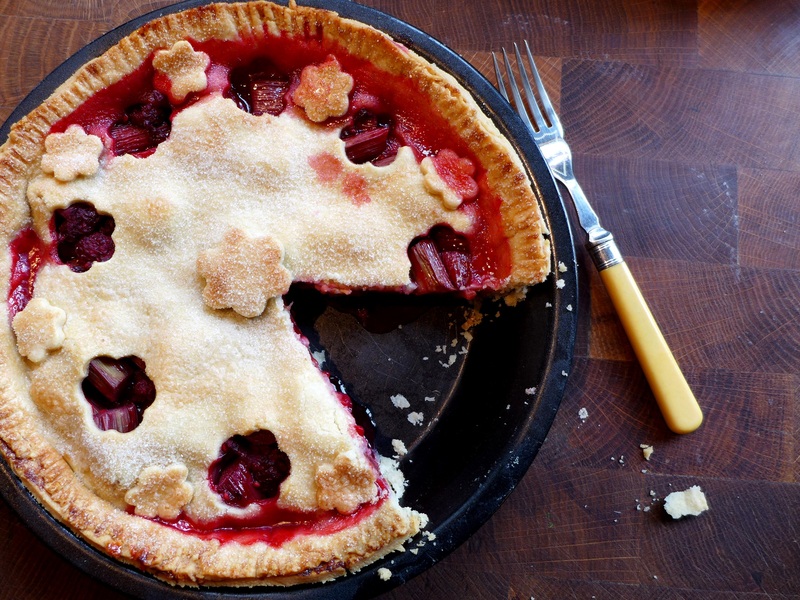 This entry was posted in Desserts, cakes and biscuits, Fruit, Vegetarian and tagged British Pie Week, fruit pie, rhubarb and raspberry pie, rhubarb and raspberry plate pie by Linda Duffin. Bookmark the permalink. Yes please to his one too. I planted some rhubarb at the allotment back in autumn but it is decidedly not coming up. And to add insult to injury the new tenant next door ripped it all out of their plot. Heathens! And they didn’t even offer it around? Time to drum them off the allotments, I think. It is a strange thing to do. We inherited ours with our allotment in London and although we dug up some roots to bring to Suffolk, we left plenty behind for the next person. Quite. Allotments are all about sharing, whether it’s knowledge, skills, enthusiasm, a handful of gooseberries, or just a handy pair of secateurs. Courgettes, Don’t forget the courgettes. And runners. Lol. 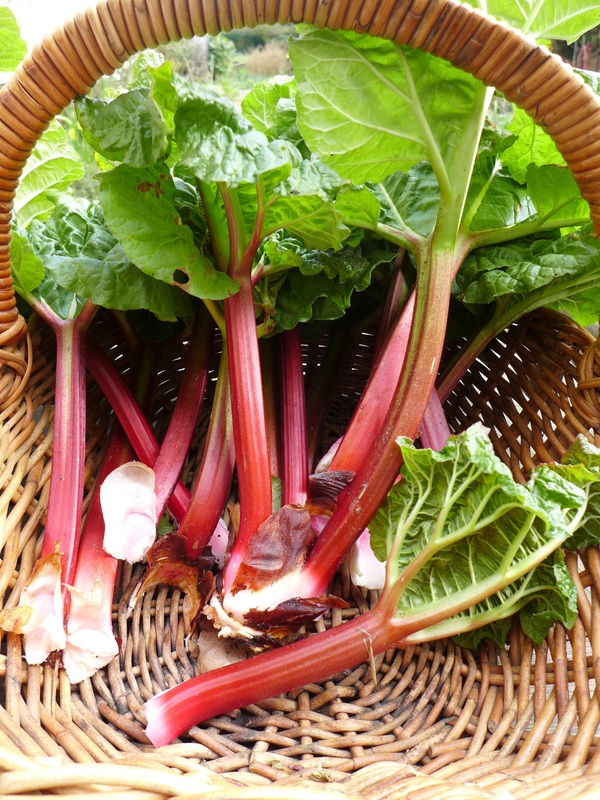 Marvellous news, rhubarb fans! I went to the allotment and found the neighbours’ clump of rhubarb on the communal rubbish heap! Duly rescued and replanted. It’s been through an ordeal but fingers crossed. How lovely! Three cheers for the rhubarb. I’m sure it’ll be fine, they’re as tough as old boots. That looks soo good! Am jealous of all these pies! !